The official Kensington Palace Twitter account has shared new photos of Princess Charlotte on her first day of nursery school, and we can’t get over how much she’s like a mini version of her mom, Kate Middleton. “The Duke and Duchess of Cambridge are very pleased to share two photographs of Princess Charlotte at Kensington Palace this morning. The images were taken by The Duchess shortly before Princess Charlotte left for her first day of nursery at the Willcocks Nursery School,” the Palace shared alongside the official snaps. We’ve been so caught up in the Prince Harry and Meghan Markle excitement that we low-key forgot about the Duke and Duchess and their ridiculously photogenic children. 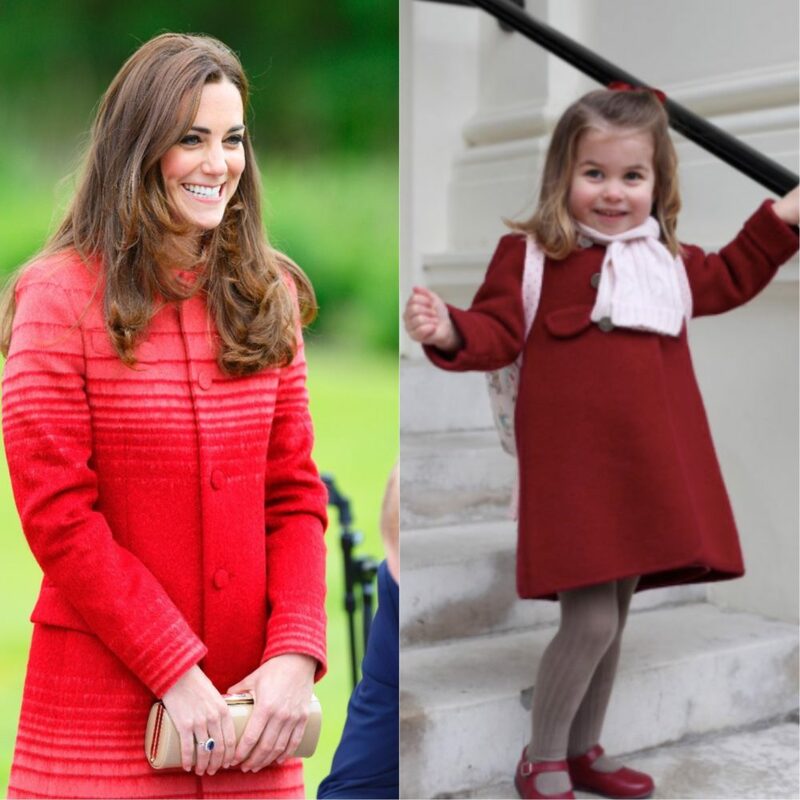 Princess Charlotte clearly takes fashion inspiration from her mom, because we all know the duchess loves a colorful wool or felt coat. It’s adorable (and fitting) that her daughter is starting school in a bright red pea coat and coordinated pink scarf. Middleton has really leaned into a preppy-chic aesthetic since becoming a royal, and it’s so sweet seeing the pint-sized version of her sartorial choices. You guysss. Can we all just take a beat to embrace the adorable mother-daughter twinning happening before our eyes? Obviously this family is hounded by paparazzi, but every so often they release private photos via their official social media account. In December, the royal family tweeted out the portrait they used in their official Christmas card. Now that we’ve got twinning on the brain, we can’t help but see Charlotte and George as miniatures of their parents. What a cute family. We can’t wait to see what other felt coats and winter ensembles little Charlotte is going to grace us with this winter.